Industrialization of intellectual property is a way to protect and bolster innovation. It is also an effective means to realize the value of and commercialize intellectual property rights, to advance technologies and enhance efficiency in production. It can drive China’s industrial upgrading, transformation and restructuring while accelerating supply-side reform, fostering new sources of development momentum, improving growth quality and efficiency, and enhancing international competitiveness. But above all, it is one important measure for implementing the country’s intellectual property strategy. A policy outline on intellectual property issued by the central government in 2008 states that “we must implement this intellectual property strategy as an important national strategy.” Since then, the intellectual property strategy has been integrated into efforts to build China into a powerful country. In particular, in recent years, the 13th Five-Year Plan and other policy documents for implementing the intellectual property strategy have been released, making intellectual property a focal point for industrial upgrading, economic transformation, supply-side reform, fostering new development momentum and strengthening international competitiveness. One of the primary challenges currently facing the intellectual property strategy is the low level of industrialization and internationalization while the globalization of Chinese intellectual property also lags behind. There are five manifestations of the low level of industrialization. The first is that the contribution of patent-intensive industries to industrial added value in the GDP is relatively low. A report released by the State Intellectual Property Office (SIPO) in 2016 showed that from 2010 to 2014, the added value generated by patent-intensive industries accounted for only 11 percent of national GDP, a proportion much lower than in the United States, 35 percent, and the European Union, 39 percent. The second is that the process of development, commercialization and utilization of intellectual property mostly occurs within domestic markets. The report also revealed that 88.1 percent of enterprises holding patents tend to invent and develop products and then sell them within the enterprise, and rarely do they operate on the market. The third is that enterprises are mostly self-reliant when raising funds for R&D. According to the report, 96.4 percent of enterprises fund their own R&D, and 81.3 individuals rely on their own savings. The level of market-based funding is extremely low. The fourth is that commercialization of intellectual property is low. In the market, only 9.9 percent of intellectual property were licensed to be used by others and 5.5 percent were transferred to others. Finally, utilization of patents is low. Only 57.9 percent of patents were utilized. In general, the industrialization level of China’s intellectual property is low and the mechanism for promoting the creation, commercialization, utilization and protection of intellectual property has still not been developed. In terms of internationalization, according to a statistical report from SIPO, of all patent applications in China in 2014 , 4 percent of the filings were from Japan, 3 percent from the EU, 3 percent from the United States, and as many as 88 percent were done locally. By comparison, in the United States and the European Union, local patents accounted for less than half of the total, indicating a much higher level of internationalization. 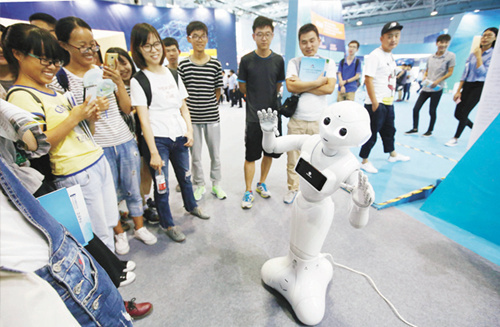 Moreover, among total global patent applications in 2014, China-based innovators filed more than 1 million submissions(12.2 percent of the total), according to the WIPO report. Though China has become the world’s top patent filer, both the number and proportion of international applications are relatively low. In terms of interaction between five major intellectual property offices—the European Patent Office, the Japan Patent Office, the Korean Intellectual Property Office, China’s State Intellectual Property Office and the United States Patent and Trademark Office—US-based innovators applied for 33,963 invention patents in China, while the applications of China-based innovators in the United States only totaled 18,040. Compared with the other four offices, the SIPO lags behind in terms of internationalization. The aforementioned challenges greatly hinder the country’s intellectual property strategy. The following ways to address these challenges are suggested. First, China should develop an industrialization mode characterized by government guidance and market incentives. On the one hand, the administrative departments should shift the focus from management to service, from authoritativeness to efficiency, from quantity to quality, and also strengthen their ability to serve and guide the industrialization of intellectual property. In addition, we should build a comprehensive service platform for providing holistic, integrated administrative services for entities in the intellectual property market. These services should be made more convenient and accessible to market entities. Entities’ demands should be responded to in a timely fashion. In China, all parties involved in intellectual property are just beginning to explore commercialization. Government support for this effort is needed. It should build platforms for transaction of intellectual property and also formulate preferential policies in tax, subsidies and risk management to support innovators and guide market dealings. The government should shift their concept of administration, proactively provide services and build transaction platforms. In this way, it can encourage market entities to be active in transactions, which in turn accelerates the industrialization of intellectual property. Second, we should build a whole industry chain operating mode. To this end, efforts can be made in the following aspects. One, we should strengthen the law and administrative enforcement for intellectual property protection and foster a good industrial environment to reduce external market risks. Two, we should build financial service platforms for intellectual property to make finance play a role in supporting all links of intellectual property industrialization, for instance, R&D, transaction, commercialization and production. Three, we should build transaction platforms to gather market players in the area so that the market can be activated and intellectual property can be commercialized in a more efficient manner. Four, we should build service platforms for intellectual property transaction. Organizations for evaluating the value of intellectual property should be set up, and indicators should be formulated to assess the transformation from intellectual property into production technology. These efforts can improve efficiency as well as the objectivity and equity of intellectual property transactions. Finally, we should construct a model for internationalization of intellectual property characterized by openness, inclusiveness and mutual benefit. Though China is still catching up in internationalization, we are accelerating the pace of intellectual property globalization. According to China’s strategic layout for intellectual property strategy and innovative development, we should construct an international coordination model characterized by openness, inclusiveness and mutual benefit. The government should strengthen the integration and coordination of foreign affairs pertaining to intellectual property while enhancing bilateral and multilateral cooperation and negotiation mechanisms in this regard. It should also actively take part in formulating and revising international rules for intellectual property, and strengthen exchanges and cooperation with the BRICS countries and countries along the Belt and Road. Furthermore, it should also reserve talent in intellectual property for Chinese organizations and institutions that are stationed in major international organizations, countries and regions. In terms of mechanisms for supporting foreign affairs in intellectual property, we should establish and improve the system for safeguarding the legal rights of enterprises by setting up funds for protecting intellectual property in overseas of Chinese enterprises. We should also formulate and implement policies for coping with major intellectual property disputes overseas, and improve information service platforms overseas for releasing information about intellectual property institutions and environment of related countries and regions to support Chinese enterprises to go out . In terms of operation mechanisms, we can set up a module for promoting intellectual property internationalization under the industrialization platform. Within this module, services for practical patent applications, transnational transfer and licensing of intellectual property, as well as information of market supply and demand should be included. Also, it should provide legal protection, financial support, and technological transfer services. It is an inevitable choice for us to build such an international model so that we can utilize domestic and foreign market resources to realize innovative development and transform China from a country with the most innovators into a country with powerful international influence in intellectual property. Wang Xuefeng is from the National Academy of Economic Strategy at the Chinese Academy of Social Sciences.